To celebrate 31 days of horror, Slasher Studios is watching one horror film a day for the entire month of October. Should be fun, right? Well, if the movies are good, it should be. These are just going to be mini reviews but I may go back and flesh out these reviews at a later time. Interested in joining in on the fun. Come join the facebook group: 31 Days of Horror. I’m hoping horror documentaries count because as documentaries go, this one was pretty damn amazing. I’ve never been the biggest Return of the Living Dead fan though I love the film’s spirit and energy. This documentary is another story all together. It is just about flawless. More Brains tells the story of how everything can go wrong on a film set and how it is still possible to make a film everyone is proud of. A lesson more indie filmmakers need to take to heart. 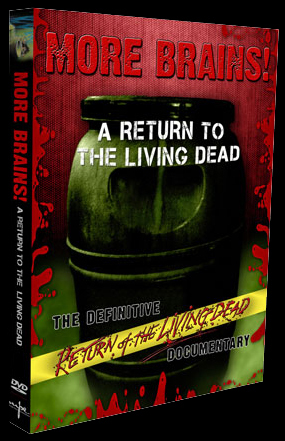 Lots of informative interviews and lots of honesty (the problems aren’t shied away from) make for an entertaining watch for even the most casual Living Dead fan.